Raccoon's are one of the most recognizable animals in the northwest because they can be found almost anywhere. The are known as natures bandits not only because of there masked look, but they can be found stealing food from houses or garbage throughout the cities. But they are wild animals and should be treated with respect because they have very sharp teeth and very sharp claws. The claws help them to be great climbers and there hands are used like humans, which is not found in many other animals. Because these animals are so smart they can become tricky to trap or remove from your house. We have different methods that can make the process easier. 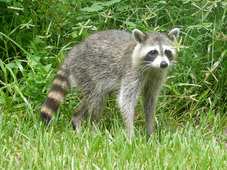 For Tigard Raccoon Removal Call 503-201-2432 Today!